Nitrotyrosine ELISA Kit | Cell Biolabs, Inc.
Nitric oxide influences a variety of biological processes including cell proliferation, apoptosis, neurotoxicity and extracellular matrix remodeling. 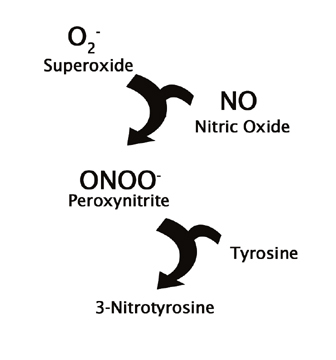 Nitric oxide reacts with superoxide to form peroxynitrite, which in turn nitrates tyrosine residues in proteins. Nitrotyrosine therefore serves as a marker for peroxynitrite action in a variety of disease states and in conditions of cellular damage and oxidative stress. Our OxiSelect™ Nitrotyrosine ELISA Kit provides a sensitive method to measure the formation of 3-nitrotyrosine in proteins. Figure 1: Formation of 3-Nitrotyrosine During Oxidative Stress. An increase in the presence of nitrotyrosine is correlated with an increase in the presence of nitric oxide (NO). 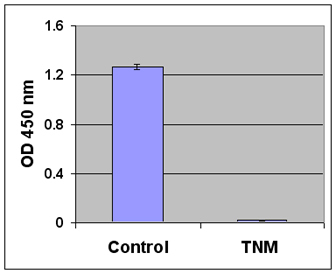 Figure 2: Protein Nitration by Tetranitromethane using the OxiSelect™ Nitrotyrosine ELISA Kit. STO (MEF) cells were lysed in 25 mM HEPES, pH 7.5, 150 mM NaCl, 1% NP-40, 10 mM MgCl2, 1 mM EDTA, 2% glycerol. The cell lysate was nitrated with tetranitromethane. The protein 3-nitrotyrosine levels were measured as described in the assay protocol. Ciarlone, G.E. and Dean, J.B. (2016). Acute hypercapnic hyperoxia stimulates reactive species production in the caudal solitary complex of rat brain slices but does not induce oxidative stress. Am. J. Physiol. Cell Physiol. 311:C1027-C1039. Mikolka, P. et al. (2016). Lung inflammatory and oxidative alterations after exogenous surfactant therapy fortified with budesonide in rabbit model of meconium aspiration syndrome. Physiol. Res. 65 (Suppl. 5): S653-S662. Liu, H. et al. (2016). Pterostilbene attenuates early brain injury following subarachnoid hemorrhage via inhibition of the NLRP3 inflammasome and Nox2-related oxidative stress. Mol Neurobiol. doi:10.1007/s12035-016-0108-8. Mukhopadhyay, P. et al. (2016). PARP inhibition protects against alcoholic and nonalcoholic steatohepatitis. J. Hepatol. doi:10.1016/j.jhep.2016.10.023. Bavunoglu, I. et al. (2016). Oxidative stress parameters and inflammatory and immune mediators as markers of the severity of sepsis. J. Inf. Dev. Ctries. 10:1045-1052. Saenen, N. D. et al. (2016). Lower placental leptin promoter methylation in association with fine particulate matter air pollution during pregnancy and placental nitrosative stress at birth in the ENVIRONAGE cohort. Environ Health Perspect. doi:10.1289/EHP38. Martinez, P. F. et al. (2016). Modulation of MAPK and NF-κB signaling pathways by antioxidant therapy in skeletal muscle of heart failure rats. Cell Physiol Biochem. doi:10.1159/000445631. Dhall, S. et al. (2016). Tobacco toxins deposited on surfaces (third hand smoke) impair wound healing. Clin Sci. doi:10.1042/CS20160236. Mikolka, P. et al. (2016). Antiinflammatory effect of N-Acetylcysteine combined with exogenous surfactant in meconium-induced lung injury. doi:10.1007/5584_2016_15. Chan, T. K. et al. (2016). House dust mite–induced asthma causes oxidative damage and DNA double-strand breaks in the lungs. J Allergy Clin Immunol. doi:10.1016/j.jaci.2016.02.017. Li, F. et al. (2016). Role of TFEB mediated autophagy, oxidative stress, inflammation, and cell death in endotoxin induced myocardial toxicity of young and aged mice. Oxid Med Cell Longev. doi:10.1155/2016/5380319. Paul, S. et al. (2016). Size restricted Silymarin suspension evokes integrated adaptive response against acute hypoxia exposure in rat lung. Free Radic Biol Med. doi:10.1016/j.freeradbiomed.2016.04.020. Adhami, N. et al. (2016). A health threat to bystanders living in the homes of smokers: How smoke toxins deposited on surfaces can cause insulin resistance. PLoS One. 11:e0149510. Unal, Betul, et al. (2016). Inhibition of neutral sphingomyelinase decreases elevated levels of nitrative and oxidative stress markers in liver ischemia–reperfusion injury. Redox Rep. doi:10.1080/13510002.2016.1162431. Sumayao, R. et al. (2016). Lysosomal cystine accumulation promotes mitochondrial depolarization and induction of redox-sensitive genes in human kidney proximal tubular cells. J Physiol. doi:10.1113/JP271858. Zhang, Z. Y. et al. (2015). Enhanced therapeutic potential of nano-curcumin against subarachnoid hemorrhage-induced blood–brain barrier disruption through inhibition of inflammatory response and oxidative stress. Mol Neurobiol. doi:10.1007/s12035-015-9635-y. Lux, A. et al. (2015). Concomitant phosphodiesterase 5-inhibition enhances myocardial protection of inhaled nitric oxide in ischemia-reperfusion injury. J Pharmacol Exp Ther. doi:10.1124/jpet.115.227850. Belpomme, D. et al. (2015). Reliable disease biomarkers characterizing and identifying electrohypersensitivity and multiple chemical sensitivity as two etiopathogenic aspects of a unique pathological disorder. Rev Environ Health. 30:251-271. Arya, A. et al. (2015). Computational method for semi-quantitative analysis of immunoblots of modified proteins using ImageJ. J Proteins Proteom. 6:261-270. Yoshioka, K. et al. (2015). Sepiapterin prevents left ventricular hypertrophy and dilatory remodeling induced by pressure overload in rats. Am J Physiol Heart Circ Physiol. doi:10.1152/ajpheart.00417.2015. Ercegovac, M. et al. (2015). GSTA1, GSTM1, GSTP1 and GSTT1 polymorphisms in progressive myoclonus epilepsy: A Serbian case–control study. Seizure. 32:30-36. Kusku-Kiraz, Z. et al. (2015). Circulating levels of apelin, glucagon-like peptide and visfatin in hypercholesterolemic–hyperhomocysteinemic guinea-pigs: their relation with NO metabolism. Mol Cell Biochem. 400:69-75. Zhang, Z. Y. et al. (2015). Cysteamine alleviates early brain injury via reducing oxidative stress and apoptosis in a rat experimental subarachnoid hemorrhage model. Cell Mol Neurobiol. 35:543-553. Peh, H. Y. et al. (2015). Vitamin E isoform γ-tocotrienol downregulates house dust mite–induced asthma. J Immunol. 195:437-444. Toth, P. et al. (2015). IGF-1 deficiency impairs neurovascular coupling in mice: implications for cerebromicrovascular aging. Aging Cell. doi: 10.1111/acel.12372. Kong, X. et al. (2015). Sesamin enhances nitric oxide bioactivity in aortas of spontaneously hypertensive rats. Ther Adv Cardiovasc Dis. doi:10.1177/1753944715586178. Maingrette, F. et al. (2015). Psychological stress impairs ischemia-induced neovascularization: Protective effect of fluoxetine. Atherosclerosis. 241:569-578. Ricciardolo, F. L. M. et al. (2015). Effect of ambroxol and beclomethasone on lipopolysaccharide-induced nitrosative stress in bronchial epithelial cells. Respiration. doi:10.1159/000381905. Wang, Y. N. et al. (2015). Protein interacting with C-kinase 1 deficiency impairs glutathione synthesis and increases oxidative stress via reduction of surface excitatory amino acid carrier 1. J Neurosci. 35:6429-6443. Arent, C. O. et al. (2015). The effects of n-acetylcysteine and/or deferoxamine on manic-like behavior and brain oxidative damage in mice submitted to the paradoxal sleep deprivation model of mania. J Psychiatr Res. doi:10.1016/j.jpsychires.2015.04.011. Sataranatarajan, K. et al. (2015). Neuron specific reduction in CuZnSOD is not sufficient to initiate a full sarcopenia phenotype. Redox Biol. doi:10.1016/j.redox.2015.04.005. Mashmoushi, A. K, & Oates, J. C. (2015). Lipopolysaccharide induces inducible nitric oxide synthase-dependent podocyte dysfunction via a hypoxia-inducible factor 1-alpha and cell division control protein 42 and Ras-related C3 botulinum toxin substrate 1 pathwaym. Free Radic Biol Med. doi:10.1016/j.freeradbiomed.2015.02.031. Toth, P. et al. (2015). Aging exacerbates hypertension-induced cerebral microhemorrhages in mice: role of resveratrol treatment in vasoprotection.Aging Cell. doi: 10.1111/acel.12315. Antošová, M. et al. (2015). The influence of L-NAME on iNOS expression and markers of oxidative stress in allergen-induced airway hyperreactivity.Adv Exp Med Biol.838:1-10. Stonehouse, W. et al. (2015). Palmolein and olive oil consumed within a high protein test meal have similar effects on postprandial endothelial function in overweight and obese men: A randomized controlled trial. Atherosclerosis. 239:178-185. Kucuksayan, E. et al. (2014). Neutral sphingomyelinase inhibition decreases ER stress-mediated apoptosis and inducible nitric oxide synthase in retinal pigment epithelial cells. Free Radic Biol Med. 72:113-123. Chou, T. Y. et al. (2014). Pulmonary function changes in rats with taurocholate‐induced pancreatitis are attenuated by pretreatment with melatonin. J Pineal Res. 56:196-203. Dhall, S. et al. (2014). A novel model of chronic wounds: importance of redox imbalance and biofilm-forming bacteria for establishment of chronicity. PLoS One. 9:e109848. Fernandez, E. et al (2014). May the thyroid gland and thyroperoxidase participate in nitrosylation of serum proteins and sproadic Parkinson's disease? Antioxid Redox Signal. 21:2143-2148. Su, W. et al. (2014). Rapamycin is neuroprotective in a rat chronic hypertensive glaucoma model. PLoS One. 9:e99719. Kassim, M. et al. (2014). Caffeic acid phenethyl ester (CAPE): scavenger of peroxynitrite in vitro and in sepsis models. Shock. 42:154-160. Bekpinar, S. et al. (2014). Propargylglycine aggravates liver damage in LPS-treated rats: Possible relation of nitrosative stress with the inhibition of H 2 S formation. Pharmacol Rep. 66:897-901. Deng, J. et al. (2014). Trans‐sodium crocetinate provides neuroprotection against cerebral ischemia and reperfusion in obese mice. J Neurosci Res. 93:615-622. Nadeem, A. et al. (2014). Acute glutathione depletion leads to enhancement of airway reactivity and inflammation via p38MAPK-iNOS pathway in allergic mice. Int Immunopharmacol. 22:222-229. Zhang, Z. Y. et al. (2014). Carnosine attenuates early brain injury through its antioxidative and anti-apoptotic effects in a rat experimental subarachnoid hemorrhage model. Cell Mol Neurobiol. 35:147-157. Martorell, M. et al. (2014). Effect of DHA on plasma fatty acid availability and oxidative stress during training season and football exercise. Food Funct. 5:1920-1931. Kumar, V. S, et al. (2014). Oxygen resuscitation and oxidative-stress biomarkers in premature infants. Research and Reports in Neonatology. doi:10.2147/RRN.S62679. Kador, P. F. et al. (2014). Topical nutraceutical Optixcare EH ameliorates experimental ocular oxidative stress in rats. J Ocul Pharmacol Ther. 30:593-602. Aslan, M. et al. (2014). Inhibition of neutral sphingomyelinase decreases elevated levels of inducible nitric oxide synthase and apoptotic cell death in ocular hypertensive rats. Toxicol Appl Pharmacol. 280:389-398. Spillmann, F. et al. (2014). LXR agonism improves TNF-α-induced endothelial dysfunction in the absence of its cholesterol-modulating effects.Atherosclerosis. 232:1-9. Lupachyk, S. et al. (2014). Treatment of peripheral diabetic neuropathy in Zucker diabetic fatty (ZDF) rats with cariporide. Journal of Diabetes Mellitu.s 4: 59-66. Oberbach, A. et al. (2014). A global proteome approach in uric acid stimulated human aortic endothelial cells revealed regulation of multiple major cellular pathways.Int J Cardiol. 176:746-752. Gaj, Z. et al. (2014). Decrease in 3-nitrotyrosine in the Amniotic Fluid of Women with Cytomegalovirus Infection. J Obstet Gynaecol. 34:251-254. Williams, D. et al. (2014). Abnormal Mitochondrial L-Arginine Transport Contributes to the Pathogenesis of Heart Failure and Rexoygenation Injury. PLoS One. 9: e104643. Singh, M. et al. (2014). Hypobaric Hypoxia Induced Arginase Expression Limits Nitric Oxide Availability and Signaling in Rodent Heart. Biochim Biophys Acta. 1840:1817-1824. Tucsek, Z. et al. (2014). Obesity in Aging Exacerbates Blood–Brain Barrier Disruption, Neuroinflammation, and Oxidative Stress in the Mouse Hippocampus: Effects on Expression of Genes Involved in Beta-Amyloid Generation and Alzheimer’s Disease. J Gerontol A Biol Sci Med Sci. 69:1212-1226. Kong, X. et al. (2014). Pioglitazone Enhances the Blood Pressure-Lowering Effect of Losartan via Synergistic Attenuation of Angiotensin II-Induced Vasoconstriction. J Renin Angiotensin Aldosterone Syst. 15:259-270. Kuczmarski, J. M. et al. (2014). Cardiac Function is Preserved Following 4 Weeks of Voluntary Wheel Running in a Rodent Model of Chronic Kidney Disease. J Appl Physiol. 117:482-491. Sureda, A. et al. (2014). Scuba Diving Induces Nitric Oxide Synthesis and the Expression of Inflammatory and Regulatory Genes of the Immune Response in Neutrophils. Physiol Genomics. 46:647-654. Kuczmarski, J. M. et al. (2014) Cardiac function and tolerance to ischemia–reperfusion injury in chronic kidney disease. Nephrol Dial Transplant. 29:1514-1524. Gao, L. et al. (2014). Activation of α1B-Adrenoceptors Contributes to Intermittent Hypobaric Hypoxia-Improved Postischemic Myocardial Performance via Inhibiting MMP-2 Activation. Am J Physiol Heart Circ Physiol. 306:H1569-H1581. Tucsek, Z. et al. (2014). Aging Exacerbates Obesity-induced Cerebromicrovascular Rarefaction, Neurovascular Uncoupling, and Cognitive Decline in Mice. J Gerontol A Biol Sci Med Sci. 69:1339-1352. DuPont, J. J. et al. (2014). NADPH Oxidase-Derived Reactive Oxygen Species Contribute to Impaired Cutaneous Microvascular Function in Chronic Kidney Disease. Am J Physiol Renal Physiol. 306:F1499-F1506. Toth, P. et al. (2014). Resveratrol Treatment Rescues Neurovascular Coupling in Aged Mice: Role of Improved Cerebromicrovascular Endothelial Function and Downregulation of NADPH Oxidase.Am J Physiol Heart Circ Physiol. 306:H299-H308. Li, F. C. et al. (2013). Transition From Oxidative Stress to Nitrosative Stress in Rostral Ventrolateral Medulla Underlies Fatal Intoxication Induced by Organophosphate Mevinphos. Toxicol. Sci. 135:202-217 (#STA-305). Medina, J.P. et al. (2013). Angiotensin Receptor-Mediated Oxidative Stress is Associated with Impaired Cardiac Redox Signaling and Mitochondrial Function in Insulin-Resistant Rats. Am J Physiol Heart Circ Physiol. 305: H599-H607 (STA-305). Kong, X. et al. (2013). Pioglitazone Enhances the Blood Pressure-Lowering Effect of Losartan via Synergistic Attenuation of Angiotensin II-Induced Vasoconstriction. Journal of Renin-Angiotensin-Aldosterone System. 10.1177/1470320313489061 (#STA-305). Lupachyk, S. et al. (2013). Endoplasmic Reticulum Stress Plays a Key Role in the Pathogenesis of Diabetic Peripheral Neuropathy. Diabetes. 62:944-952 (#STA-305). Cho, W.K. et al. (2013). IL-13 Receptor α2-arginase 2 Pathway Mediates IL-13-Induced Pulmonary Hypertension. Am J Physiol Lung Cell Mol Physiol. 304:L112-L124 (#STA-305). Montez, P. et al. (2012). Angiotensin Receptor Blockade Recovers Hepatic UCP2 Expression and Aconitase and SDH Activities and Ameliorates Hepatic Oxidative Damage in Insulin Resistant Rats. Endocrinology. 153:5845-5856 (STA-#305). Tahrani, A.A. et al (2012). Obstructive Sleep Apnea and Diabetic Neuropathy: A Novel Association in Patients with Type 2 Diabetes. Am. J. Respir. Crit. Care Med. 186: 434-441 (#STA-305). Suvakov, S. et al. (2012). Glutathione S-transferase A1, M1, P1 and T1 Null or Low-Activity Genotypes are Associated with Enhanced Oxidative Damage Among Haemodialysis Patients. Nephrol. Dial. Transplant. 10.1093/ndt/gfs369 (#STA-305). Shevalye, H. et al. Metanx Alleviates Multiple Manifestations of Peripheral Neuropathy and Increases Intraepidermal Nerve Fiber Density in Zucker Diabetic Fatty Rats. Diabetes. 61:2126-2133 (#STA-305). Sanchez, C.P. et al. (2012). Mitochondrial Dysfunction in Antiphospholipid Syndrome: Implications in the Pathogenesis of the Disease and Effects of Coenzyme Q10 Treatment. Blood. 19:5859-5870. Kannan, S. et al. (2012). Dendrimer-Based Postnatal Therapy for Neuroinflammation and Cerebral Palsy in a Rabbit Model. Science Translational Medicine. 4:130ra46. Wray, W. et al. (2012). Acute Reversal of Endothelial Dysfunction in the Elderly After Antioxidant Consumption. Hypertension. 59:818-824 (#STA-305). Dong, Y.F. et al. (2011). Beneficial Effects of Combination of Valsartan and Amlodipine on Salt-Induced Brain Injury in Hypertensive Rats. J. Pharmacol. Exp. Ther. 339:358-366 (#STA-305). Andreazza, A.C. et al. (2010). Mitochondrial Complex I Activity and Oxidative Damage to Mitochondrial Proteins in the Prefrontal Cortex of Patients with Bipolar Disorder. Arch. Gen. Psychiatry 67:360-368 (#STA-305). Drel, V.R. et al. (2009). Poly(adenosine 5'-diphosphate-ribose) Polymerase Inhibition Counteracts Multiple Manifestations of Experimental Type 1 Diabetic Nephropathy. Endocrinology 150:5273-5283 (#STA-305). Drel, V.R. et al. (2009). New Therapeutic and Biomarker Discovery for Peripheral Diabetic Neuropathy: PARP Inhibitor, Nitrotyrosine, and Tumor Necrosis Factor-Alpha. Endocrinology 10.1210/en.2009-1342 (#STA-305). Cheah, F.-C. et al. (2009). Airway Inflammatory Cell Responses to Intra-Amniotic Lipopolysaccharide in a Sheep Model of Chorioamnionitis. Am. J. Physiol. Lung Cell Mol. Physiol. 296:L384-L393 (#STA-305). Li, X. et al. (2008). Lipoamide Protects Retinal Pigment Epithelial Cells from Oxidative Stress and Mitochondrial Dysfunction. Free Radic. Biol. Med. 44(7):1465-1474 (#STA-305).